The House of Worth, established in Paris in 1856 by Charles Frederick Worth (1826-95), was the original and founding couture house. Worth London was an offshoot of the original. 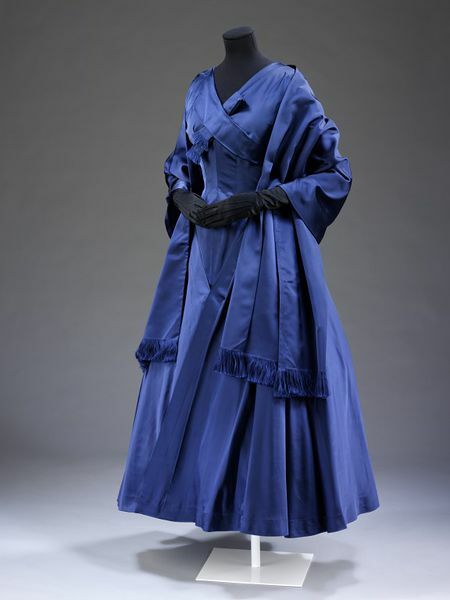 It created refined, well-mannered garments for a mainly English clientele and the London social season. This evening gown is an elegant and understated example of 1950s couture. 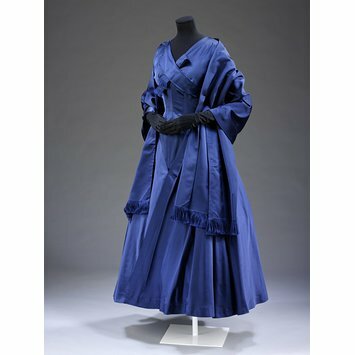 It is made of navy satin with a matching stole, and has carefully crafted pleats and draping details which show the influence of the French couturier Christian Dior (1905-57). A navy evening dress of satin and faille, cut on the bias with interesting pleats and draped skirt detailing. The neckline is a V shape cross-over detail with fringed fabric detail in one of the pleats. The dress is fastened at the back with hooks and eyes and a zip at a diagonal to the right side of a V shaped plunge from bodice to skirt. At this back fastening are two superficial self covered buttons. No corsetry construction or lining inside bodice. The full skirt has a cross-over V effect pleating from the hips. The skirt lining is silk and nylon net, fastening with a hook and eye at the waist. There is a matching stole with fringed edging. The House of Worth was established by Charles Frederick Worth in 1856 in Paris, and flourished through the generations until it merged with Paquin in 1953. The London branch of the House of Worth survived until 1967 as the name was purchased by Sydney Massin in the early post-war period, and Worth London Ltd. operated from 50 Grosvenor Street until that date. The fringed fabric detail in the pleats and stole owe much to Dior, who often employed such 19th-century touches.